Radianse, the pioneer and leading provider of healthcare Real Time Location Systems (RTLS), today announced the immediate availability of the R-1700 advanced RTLS receiver, a member of the R-1000 Series family. This new product simplifies RTLS infrastructure design, speeds up implementation and lowers the cost of system installation. The R-1700 incorporates an attractive ergonomic wall-mounted case that nicely blends into any healthcare environment. The new receiver features an enhanced internal RF antenna design that allows for long read ranges and a higher degree of precise location accuracy. In addition, the reader can stream data collected from active-RFID tags across either a Local Area Network (LAN) or Wireless (WiFi) infrastructure, further adding flexibility to RTLS system design. The reader supports Power over Ethernet technology, a plus for environments where power is not readily accessible. With its long read ranges and superior coverage capability within complex healthcare environments, fewer R-1700 reader units are required in most RTLS designs. This important feature helps to substantially lower the overall cost of installation for new RTLS networks. The R-1700 incorporates several new dynamic location algorithms and an improved positioning technology architecture, which makes this product stand out in the industry. These new algorithms further extend the quantity and quality of patented (and patent pending) algorithms that Radianse has pioneered over the last decade. Radianse is also introducing the E-700 Enhancer, a very low cost RTLS reader that is ideal to situate in areas that require precise room, or specific area (i.e. bed), level accuracy. This device acts as an enhancer to the R-1700 reader and continually communicates important ID-Tag location positioning and status information. The E-700 device automatically senses activity in a defined area and identifies specific tags that are within a highly-focused range. The E-700 is battery powered, which allows it to be quickly and easily installed in any location within minutes. 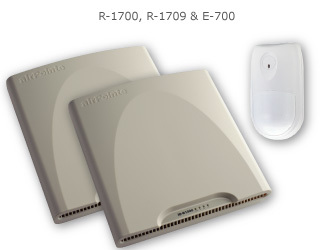 The R-1700 advanced receiver and the E-700 enhancer are available immediately.